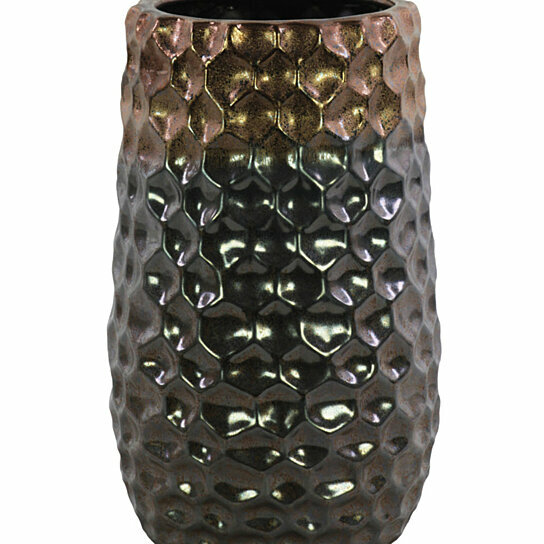 Urban Trends Ceramic Round Vase with Broad Lips, Embossed Diamond Design Body, Gold Banded Rim Top and Tapered Bottom, Metallic Finish Dark Gray - Small. Item number: 50308 is truly a masterful work of art! Suitable for both aesthetic and functional purposes and a great addition for enhancing the ambiance of any part of your home or business! A perfect gift for every occasion! Impress your friends and family with fine craftsmanship and intricate detail that even the most scrutinous critics might fail to define! Eventhough each pc. Vase is internationally renowned for its superior quality, rest assured that this item will have its own distinct personality with its fine Metallic Finish in its outstanding shade of Multi-Colored. WARNING: This product can expose you to chemicals including lead, which is known to the State of California to cause cancer and birth defects or other reproductive harm. For more information go to www.P65Warnings.ca.gov.